Iridology is the science of the study of the iris of the eye to determine tissue weakness or predisposition to tissue weakness in the body. By way of definition, it is the science and practice revealing inflammation, where located, and in what stage it is manifesting. The iris reveals bodily conditions, inherent weaknesses, levels of health, and the transition that takes place in a person’s body according to the way he or she lives. This adjunctive analysis allows the doctor to relate markings and signs in the iris to reflex manifestations in the body. The eye has been proclaimed through the ages as “the mirror of the soul”, and now we acknowledge it as the window to the body- enabling us to visualize normal and abnormal states within the body and its organs. How does the iris represent all this? Contained within the iris are thousands of nerve filaments. They receive messages from virtually every nerve in the human body via connections with the optic nerves, optic thalami, and spinal cord. Also, microscopic muscles fibers and tiny blood vessels are within the eye. In cooperation, the nerve filaments, muscle fibers, and blood vessels duplicate tissue changes simultaneously with reflexly associated organs of the body. Thus, by examining the markings, discolorations, textures, and other iris manifestations, the practitioner is able to analyze the health level of all body constituents. Relevant to bodily changes, the iris changes likewise. Black gouges can indicate, dying tissue or scarring. Rings on the iris’ edge can indicate, high-stress levels. Arcs of whitish blue on the outside of the iris can indicate a slow metabolism. White dots or lines in the iris can indicate inflammation. This science was discovered in part, in the 1800’s by a Hungarian medical doctor, Ignatz VonPeczely, who observed an owl with a broken leg. He was intrigued by a dark line in the owl’s iris while the leg was broken. After the leg healed, the black stripe eventually became a tiny black spot, surrounded by white lines and shading. When he grew up, Ignatz VonPeczely, became a physician; he mapped out an iris map based on correlation between iris markings and his patients injuries, surgeries or illnesses. 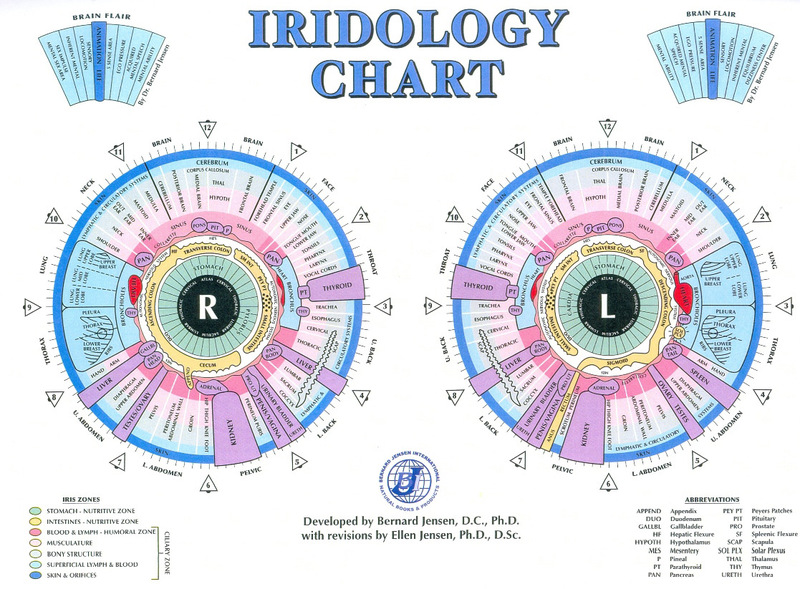 Iridology has progressed over the years. Dr. Bernard Jensen is the founder of iridology here in the United States. NOTE: Please keep in mind that Iridology is for assessment purposes, and not diagnosis.